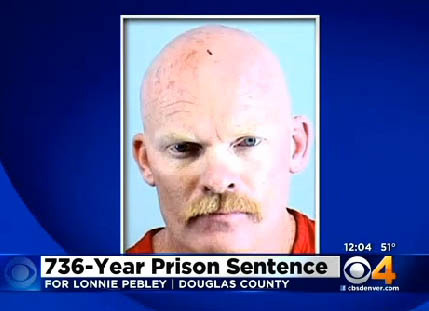 CASTLE ROCK, Colo. -- A judge in Colorado on Friday sentenced a convicted felon who shot at 27 police officers to more than 700 years in prison -- 736 to be precise, for Lonnie Pebley, CBS Denver reported. "Seven-hundred and thirty-six years is justice in this case for this evil that was on them," said 18th Judicial District Assistant District Attorney Mark Hulbert. The crime took place over a 30-minute period in Castle Rock, about 25 miles south of Denver, on July 4, 2012. According to CBS Denver, Pebley fired about 70 rounds with an AK-47 and a handgun from his house. "Lonnie Pebley set out to kill as many officers as he could. He attempted to kill the very officers who protect and service our community each and every day, " Castle Rock Police Chief Jack Cauley said. "For 30 minutes our officers endured high powered rounds being shot at them as Lonnie Pebley was determined to kill them," Cauley added. Pebley then ran from the home sparking a manhunt that lasted about seven hours. During Friday's sentencing, the station says, the judge commended the restraint police officers used in the assault, by only firing two rounds back at Pebley. "The tactical team rescued the men and women of the Castle Rock Police Department who were being pinned down by gunfire with the use of the regional SWAT teams' bear cat, which just so happens that piece of equipment was put into service that day," said Douglas County Sheriff Tony Spurlock. "They heard rounds whizzing by their heads, by their hands. They had to check to see if they were hurt," said Chief Cauley. Pebley's defense claims he was experiencing possible psychosis from a new arthritis medication, but the jury found him guilty of 46 counts, including attempted first-degree murder, CBS Denver reported. Pebley didn't have any legal right to possess firearms at the time of the shootout because he was a convicted felon.